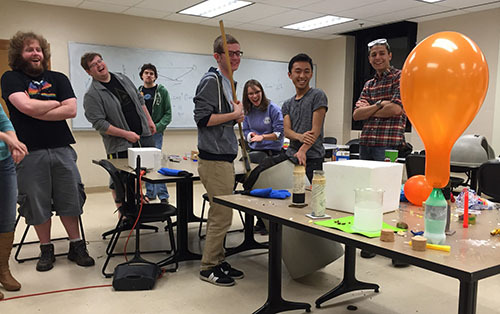 The presentations with which Purdue Physics and Astronomy Outreach ventures off campus to locally engage students with the wonders of science in informal learning environments is encompassed under Physics On the Road. Physics On the Road provides opportunities for students to experience and develop interest science in ways not typically available to them in classroom settings, and to foster understanding of fundamental scientific principles and concepts, in lively, entertaining, and engaging ways. 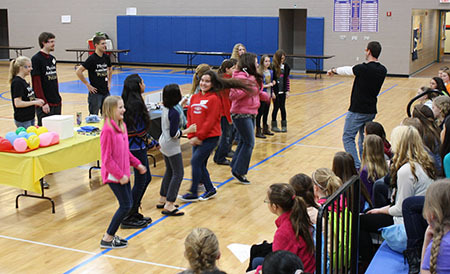 At left, graduate researcher Andy Hasselbrock is teaching about the nature of thermal energy at Curiosity, Confidence and Challenge, an annual career orientation conference for middle school girls, at Sycamore School in Indianapolis. 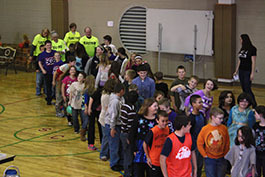 Students acting as atoms and molecules at extremes of temperature is a part of our Liquid Nitrogen Show Starring N2. Our The Liquid Nitrogen Show Starring N2, is a foray into the realm of cryogenics and allows students to explore the changing properties of matter under extreme temperatures with examples of physical and chemical changes, properties of sound and electrical conductivity. Building on the fundamentals of simple electric circuits, for example, students learn and experience first hand what it is like to be an electron or an atom in a conducting material. These young cub scouts explore the relationship between volume and temperature of gas in balloons. They are doubly surprised to find they can pound nails into wood with a banana frozen in liquid nitrogen. 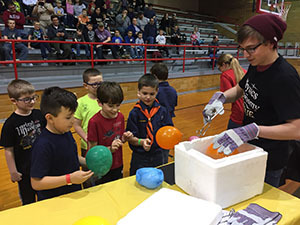 Physics On the Road programs like The Liquid Nitrogen Show Starring N2, leverage talent, expertise and resources from Purdue’s campus to engage and entertain venues throughout central Indiana for elementary and middle school assemblies, convocation, special events, and community programs. For example, at Grandparents’ Day at Sugar Creek Elementary School, 4th graders learned alongside their grandparents about electric circuits material properties and the particle nature of matter. 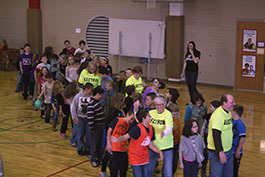 In the grand finale (below), grandparent “electrons” modeled resistance of electric current in a wire composed of student “atoms” at different temperatures. Newton’s Laws and the principles of inertia, momentum, rotational motion, and the conservation of energy provide a foundation for the Physics on the Road, Force and Energy Show. 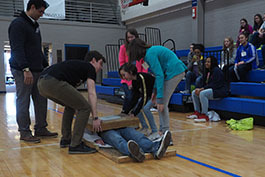 In a demonstration of inertia and acceleration from the force exerted by a compressed gas, service learning student and regular volunteer, Alex Weldy, (below) blasts off to demonstrate acceleration of a body at rest. Now that’s a real attention getter! 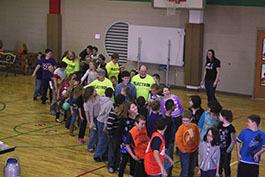 Other concepts from our Force and Energy Show include Bernoulli’s Principle and vortex forces. 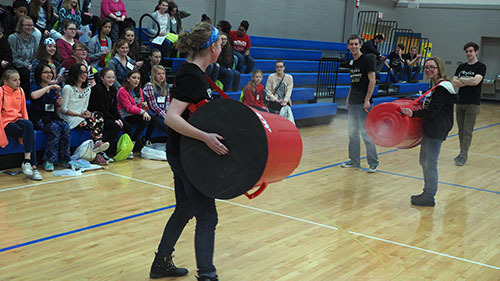 At right, physics student volunteers Katie Bowen and Cassidy Ames duke it out with their vortex cannons. Katie can blast a cup off your head at fifty feet on a good day! 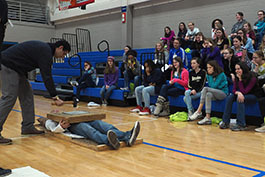 And what Force and Energy show would be complete without the bed of nails? Audience volunteers seem very willing to lay flat on a bed of almost 4000 nails and no, having a forty pound block laid on your chest doesn’t seem to hurt at all. We haven’t punctured anyone yet! 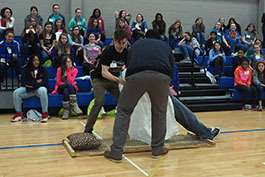 Below, volunteer and service learning student Prince Aly hammers down on this unsuspecting soul. C’mon Prince, is that all you’ve got? An essential and valuable component of our off-campus programs is the time, material resources and content expertise contributed by Purdue’s SPS (Society of Physics Students), undergraduate and graduate service-learning students, pre-service science teachers, and Physics and Astronomy faculty and graduate research staff. These SPS volunteers are having fun rehearsing for a presentation, inflating a balloon stretched over a bottle containing liquid nitrogen. We welcome opportunities for something new. 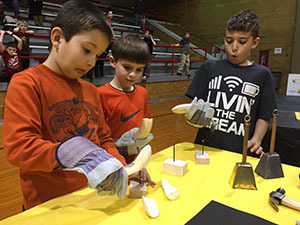 If you have an idea for a Physics on the Road program, or would like for us to customize a Road Show presentation for your specific curriculum, venue or interest, please contact Purdue’s Physics and Astronomy Outreach. Physics On the Road programs are supported by gifts from our clients and friends. We are happy to suggest a contribution for bringing a program to your school, based on mileage, materials, and the nature of the program.